Cammy Bean's Learning Visions: Informal/DIY Learning: Montessori School for Adults? Informal/DIY Learning: Montessori School for Adults? We've been exploring the notion of sending our son to a local Montessori school come this fall. He'll be 4. So last week, we had the chance to take a tour of the school, peek in on some classrooms, and ask a lot of questions. My first response was, "I want to go to Montessori School." It looks awesome. 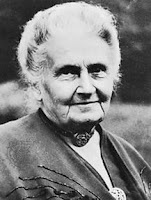 Now, I don't know all the theory and I've only read a bit about Maria Montessori (the founder of this approach) and the Montessori Method. 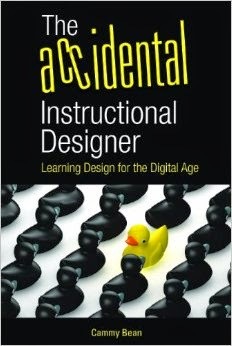 But there seem to be some similarities between that and informal learning/DIY learning -- all this adult stuff we've been talking about lately. concentration rather than group lessons led by an adult. Kids get to choose what they want to do for their "work" each day. If your kid just wants to polish brass for three hours, so be it. That's where he needs to be . And he's learning some great skills. Self-directed. Kids go at their own pace. Polish brass for 10 minutes. Pick up a puzzle. Eat a snack when you feel like it. (How revolutionary! The snack table is ALWAYS set up. I like that.) No forced transitions. No "Now is the time we color. Now is the time we sit on carpets and listen." Kids define their workspace. Role out a mat on the floor and voila! -- you've got your boundaries and your workspace -- your "office" all set up. Learn from your peers -- water cooler style. Classrooms are made up of mixed ages. Big kids model new activities for the little ones. Little ones learn by observing big ones and asking questions. Mentoring occurs at the peer level. Teacher is often in observe mode. When the teacher sees that the child is ready for the next challenge, he or she may step in and do some one-on-one instruction. I guess this is the "formal" part. The seminar or workshop. But again, it's customized for the child. "I see you've mastered the sandpaper letters....let's see what you can do with the block letters." It's the manager seeing what questions need to be asked next and stepping in. This informal style is the rule, even at the middle school level. Classrooms have tables in circles. And couches. Kids work on their geometry homework together or alone. Whatever works best. The conversation seems fluid and open. And learning is going on all around. I work for a library in Indiana. Due to the local school corporation's decision to discontinue their Adult Education, GED and ESL classes, my library and other area agencies are part of a consortium to fill this gap. Besides hosting GED classes, the library is planning to start Montessori based classes for Adult basic education students. This may not be what you meant, but I think all adults can learn from a Montessori approach. As a trained Montessori teacher myself, I learned a lot of things while taking my training.